I have never liked this wooden sculpture located outside Dublin City Civic Offices at Wood Quay but now that it has been painted black it looks much better when seen from the North side of the river. 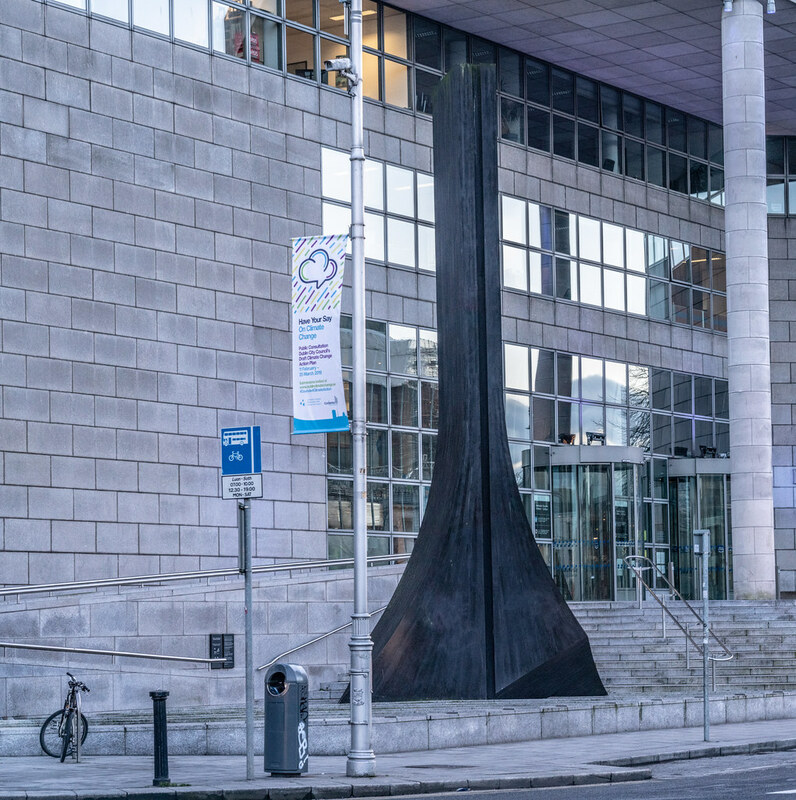 The Wooden Sculpture 'Wood Quay' by Michael Warren outside the offices of Dublin City Council is meant to invoke the prow of a Viking longship. Michael Warren (born 1950 in Gorey, County Wexford, Ireland) is an Irish sculptor who produces site-specific public art. Inspired by Oisín Kelly, his art teacher at St Columba's College, Michael Warren studied at Bath Academy of Art, at Trinity College, Dublin and, from 1971-75, at the Accademia di Brera in Milan. He now lives and works in Co. Wexford. He has a number of very visible works in Ireland, including the large sweeping wood sculpture in front of the Dublin Civic Offices. Wood Quay, where the civic offices stand, was the centre of Viking Dublin and the sculpture evokes the form, and the powerful grace, of a Viking ship. It also reflects vertically the horizontal sweep of the nearby Liffey as it enters its bay. A complex balance of meanings matching a delicate, though massive, balance of substance is typical of his work. Warren himself describes the useful ambiguity of abstraction (Hill 1998) "Whatever you might intend a form to suggest, people will find its significance from within their own culture, so that something that is read as a reference to Viking longboats in Dublin, is seen as evoking the art of calligraphy when viewed in Japan". With Roland Tallon he created Tulach a' tSolais (Mound of Light), a memorial to the 1798 rebellion. Here, a room was hollowed out of a small hill; the room contains two abstract curved oak forms and is illuminated by natural light falling through a long slot in its ceiling and walls. Despite the unusual and abstract constitution of this memorial and despite the fraught political resonance of the rebellion, Tulach a' tSolais is popular and something of a local attraction. His Gateway in Dún Laoghaire is less popular with some local people calling for it to be removed. At the northern entrance to the village of Leighlinbridge, County Carlow, is a sculpture by Michael Warren, depicting the thrones of the ancient seat of the Kings of South Leinster at Dinn Righ (The hill of the Kings). The Kings of Leinster lived near the village.